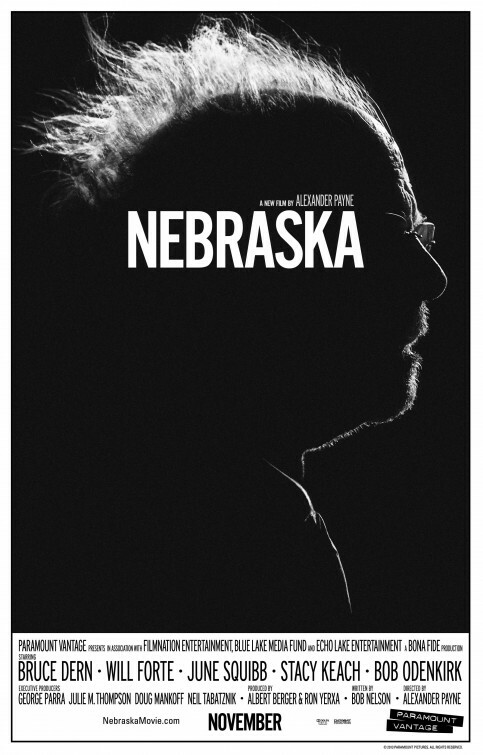 Alexander Payne’s “Nebraska” is basically an old fashioned road movie with terrific acting, beautiful cinematography and a delightful soundtrack. Watching a film as mature, moving and thoughtful as this one renews my faith in American movies and reaffirms Payne’s status as one of the most unique storytellers of his generation. He has also bestowed the gift of an exceptional role on Bruce Dern, 77, who gives the best performance of his career. He plays Woody, a stubborn old man who is convinced that he’s won a million dollars and insists on traveling to Lincoln, Nebraska to claim his prize. Instead of stopping him, his son (Will Forte) decides to play along. This is the part where you ask: is this a comedy or a drama? And yet if you’ve seen most of Payne’s films (“About Schmidt”, “Sideways”, “The Descendants”), then you probably know that the answer is both. This is what Payne does best. He walks the high wire between humor and heartbreak with exceptional skill. Just when you think you have him figured, you haven’t. Woody and his son travel a bumpy road, and the film hits a few plot holes. But for the most parts, the movie’s a gem. Payne’s low-key approach only deepens the film’s intimate power. And Bruce Dern’s acting sets a new gold standard, making “Nebraska” a movie you won’t soon forget.